Chic and simple, the ChargeIt by Jay Black Regency Round Melamine Charger Plate 13" boasts a contemporary styling that looks great as part of any formal affair and traditional setting. 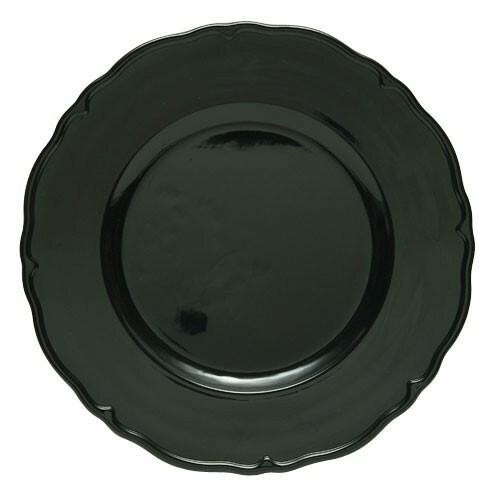 This charger plate is designed with an embossed rim that adds visual flair while its sleek black finish provides a striking backdrop for any piece of dinnerware. Made from break-resistant melamine, this charger combines a delicate look with exceptional durability making it ideal for intimate restaurants and fine dining establishments. Perfect for multi-course meals, this charger plate accommodates any size plate and prevents spills and mess. Clean up is also breeze, simply hand wash, dry, and store.